Final Fantasy XIV: Shadowbringers, the third major expansion for Square Enix’s MMO, is due out this July. At a festival today in Tokyo, the publisher revealed a lot more information about the new content coming in Shadowbringers, including the announcement of the Dancer job class. However, this reveal has not received the welcome Square Enix may have expected, as fans are disappointed that Dancer appears to be a combat class. The reveal of the Dancer class was made at the Final Fantasy XIV Fan Festival today in Tokyo, Japan. This new job class is the second to be revealed as coming in the Shadowbringers expansion, with the first being Gunbreaker. 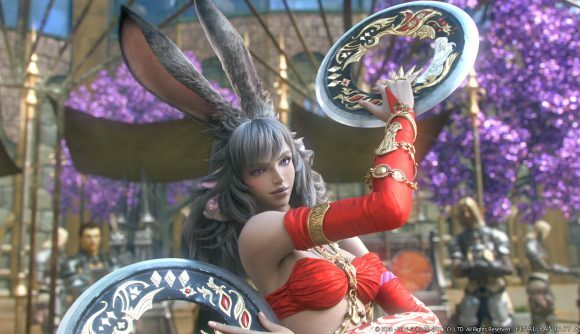 There’s also a new playable race, the Hrothgar, which follow the announcement of the Viera (er, the bunny girls). There’s even a new Raid based on Nier Automata, designed by Kingdom Hearts director Tetsuya Nomura. It’s the new Dancer job that’s receiving the most attention, however, since it’s a ranged attack class that “unleashes powerful attacks using throwing weapons”. Players are disappointed in this because they were hoping for a Healer class, whereas the FF14 Dancer is more about attack than support. The disappointment stems from the previous appearance of the Dancer class, which was in the last Final Fantasy MMO – Final Fantasy XI. Here, the Dancer was completely a support class – using a mixture of healing and debuffs, although it was capable of dagger-based attacks. The reverse seems to be true of the Final Fantasy XIV Dancer, who is more focused on attacking, but additionally can “provide beneficial effects to their party”. No mention is made of healing, and the replies to the job’s reveal on Twitter made note of this. The last Healer class to appear in the game was in the Heavensward expansion four years ago. The Final Fantasy XIV: Shadowbringers expansion will take players to the First World and the realm of Norvrandt, in order to become Warriors of Darkness. Apart from everything mentioned above, there will be two new player cities to explore, The Crystarium and Eulmore, and a new Field area, Lakeland. Shadowbringers will release on July 2.